Yet another early start this morning, this time for the bus to La Paz. 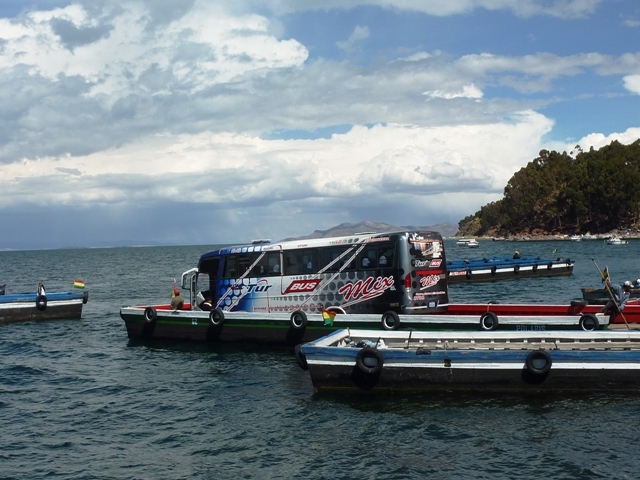 The bus followed the perimeter of the lake until we reached the Peru/Bolivia border where we could change money and go through passport control. Somehow, in all the excitement, I managed to miss out the stage where I got my exit stamp from Peru, and so the friendly guard at the Bolivian checkpoint made me walk all the way back to Peru to complete the formalities there, and then I had to run all the way back into Bolivia to acquire an entrance stamp before the bus went without me. It was exhausting I tell ya! 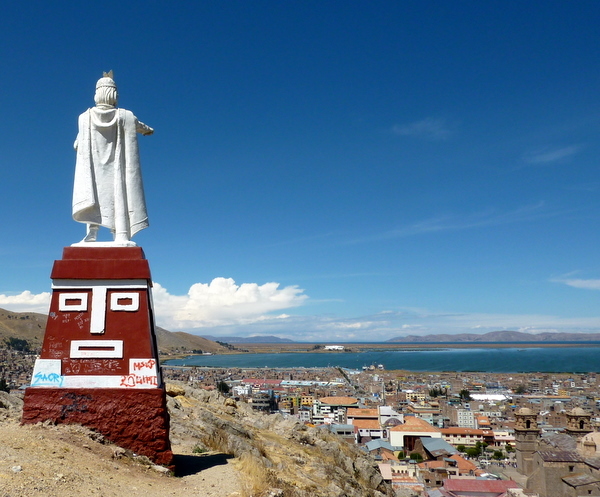 About an hour away from Copacobana, we were still following the perimeter of Lake Titicaca, but that was soon to change. The bus stopped and the driver made an announcement in Spanish. “Did you understand that?” asked the Australian girl sitting next to me. I thought I understood it. I just didn´t quite believe it, because apparently, we all had to get off the bus, so that they could put the bus on a raft across the lake. And we would pay 1.50Bs for a boat across to the other side. It seemed that noone was expecting this, even those who had been in Bolivia before, but it was indeed true and we disembarked to fill up a passenger boat which didn´t quite start until the 4th attempt and had five flimsy looking life jackets hanging, presumably for decoration from the roof. Once on the other side, we watched our bus float slowly and safely to meet us and we got back on to complete the journey. Once away from the lake, dark grey mountains began to poke their triangular summits over the horizon underneath the dark grey clouds which were gathered ominously above La Paz. When it finally did rain, we didn´t miss out on it for being on the bus, because the rain came through the skylight. Luckily it didn´t last for very long! As we drew closer to the city, swarms of colectivos gathered on the roads, swerving in and out of the traffic, and bellowing black smoke into the air, a sure sign that I´d soon be able to get off the bus and stretch my legs. At the bus terminal, I followed Claire, who I had met on the bus to a nearby hostel and allowed her to guide me to a place for dinner and back to the hostel. After a day of travelling, I wasn´t in the mood to tackle a big smelly chaotic city on my own so it was nice to have the company. We ignored the knock on our window at 4am, and again at 5, which I think was an alarm call for if we wanted to go and see the sunrise, and instead we slept until 6am before crawling out of bed to collect our meagre breakfast, and walk back down to the docks. Where our ´family had pointed us in the right direction and left us to it, other families were waiting at the docks with their tourists. 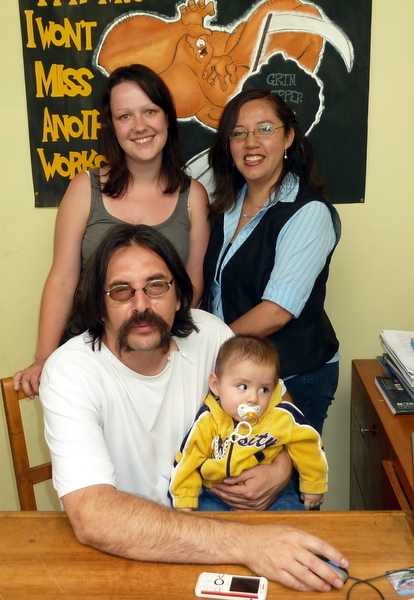 This seemed to suggest that we hadn´t quite got the level of service that others had received from our ´family´… oh well! It was an hours snooze on the boat to the next island: Taquile. 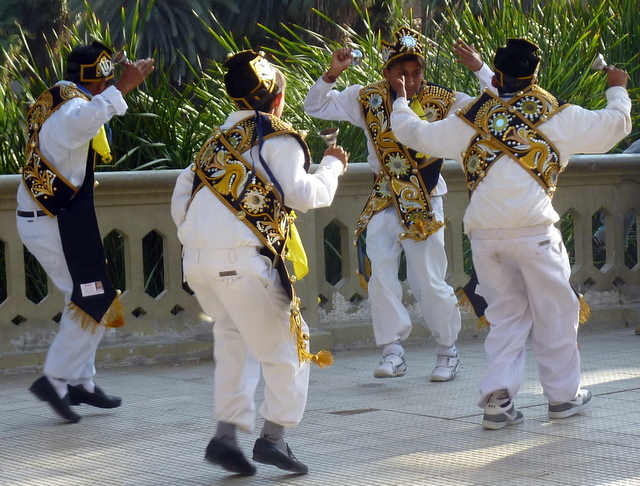 Here, the local men dressed in dark trousers, a white shirt, dark waistcoats and colourful wooly hats, and it wasn´t long before we found out more about this fascinating community and their mysterious dress code. Any man with a hat boasting a white panel at the bottom was single. If their hat was full colour, that meant that they were married. You might also see some engaged men with white bottomed hats wandering around the place, but you can tell that they are engaged because they are carrying a colourful bag around with them, or wearing a decorative belt, because these are always a gift from a woman. The belt that the woman makes when she gets engaged is partially woven from her own hair, and the bag contains a supply of coco leaves for her intended. For the women, the dress code is a little more simple – if they are wearing brightly coloured skirts, they are single because the darker colours are reserved for married women. Divorce is unheard of in this community, and there is public punishment for any man who dares to stray (they didn´t mention the women). After this fascinating presentation, we enjoyed a fish lunch before walking back down the hill to the boat where we climbed up onto the top deck and basked in the sunlight for the 3 hour journey back and talked about fruit. 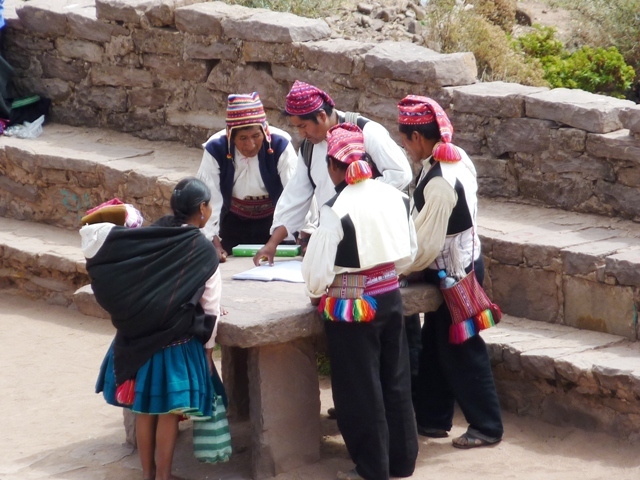 At 5am , someone else arrived in my otherwise empty dorm and a sighed a heavy sigh at the prospect of having to creep around quietly to get my stuff together in preparation for today´s trip to Lake Titicaca. But I needn´t have wasted my sigh, because it turned out that my new roommate, Carolina from Brazil was on the same tour, and so we got ready together and made our way down to reception to wait for our pick-up. 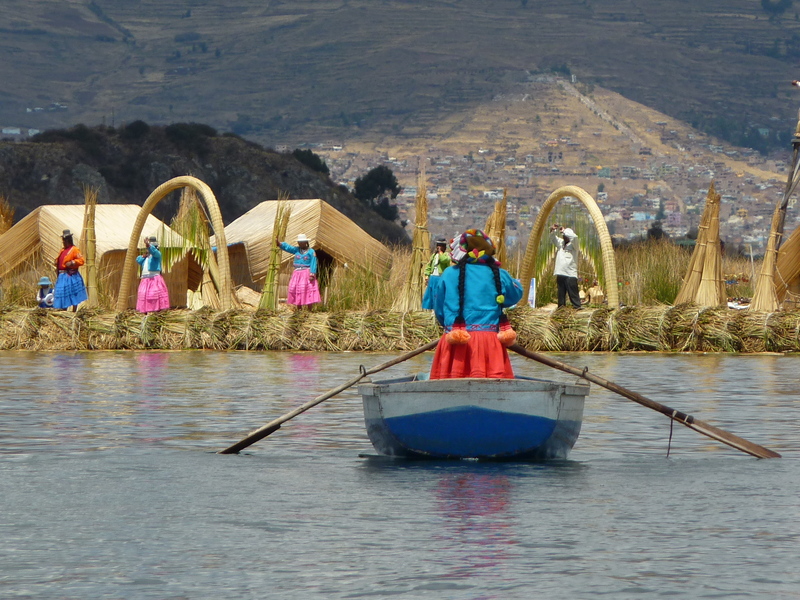 We were driven down to the docks where we boarded the Inka II with our guide, Moses for the short journey to one of the 60 odd Uros floating islands. As we approached the floating villages, we could see lines of women, dressed in brightly coloured skirts, gathered on the ´shores´of their islands, waving out to passing boats, and hoping that one of them would come their way to spit out their wealthy tourist content so that they could sell their wares to them. 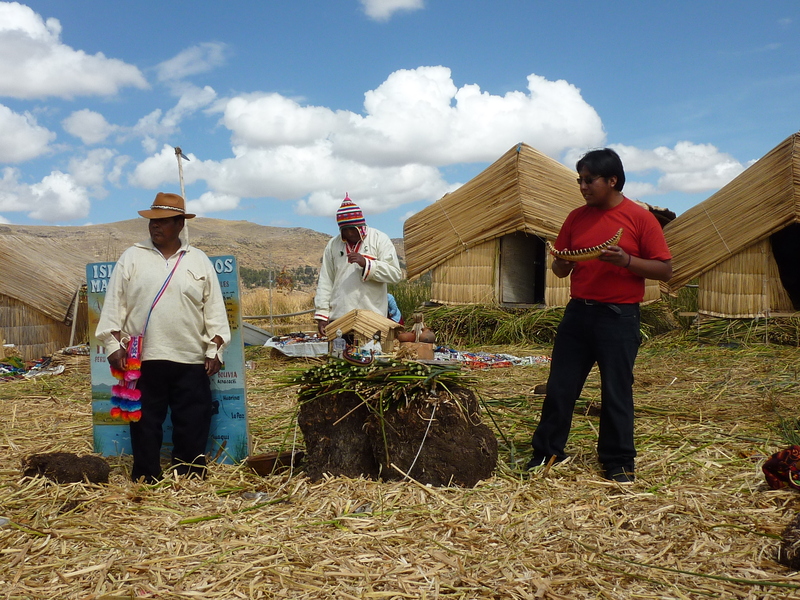 We stepped onto our chosen island, and greeted its residents in Quechua, as our guide had instructed us, and found ourselves on a surface made of dried out totura reeds. Gathered in a semi-circle we listened and watched as our guide, with the help of some of the residents demonstrated the making of a floating island. The ingredients – 1m blocks of reed r00ts, bundled together with ropes, and anchored to the bottom of the sapphire blue lake, under the sky blue… errr… sky, complete with fluffly white clouds, hanging like cliches in the sky. It was amazing to think that the whole structure was created from the same plant, and that the locals spent every weekend replacing the surface with fresh reed to replace that which had been dried to nothing by the intense sunlight. No more than 20 square metres, the people who live there not only build their houses from the reed, but also their boats. 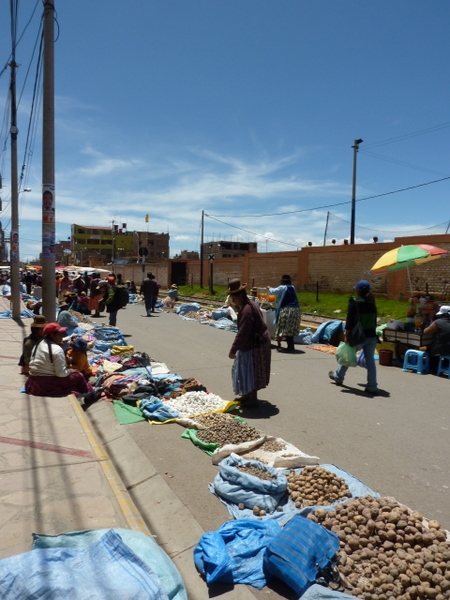 Fishermen by trade, every weekend, a few representitives from the community would row back to Puno to exchange fish for other goods at the vast market and in that way, they made their living. Well, and by selling their beautifully made, yet pricey crafts to tourists. After the educational bit, we went for a look around the tiny houses and they dressed me up in a big pink skirt, a silly hat and threw pompoms around my neck so that I could blend in with the locals, before they tried to sell me stuff. 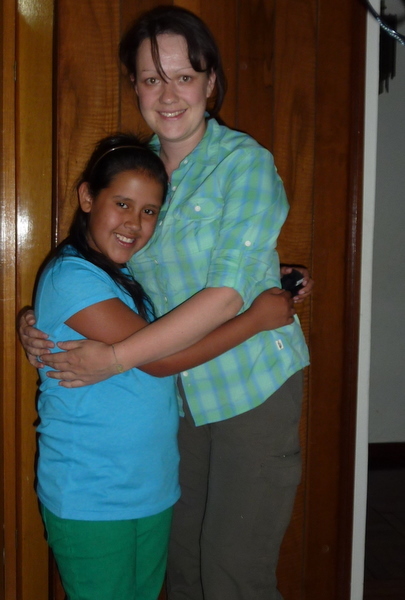 Later that day (a 3 hour boat ride), we arrived at Amantani where we would be staying the night with a local family. 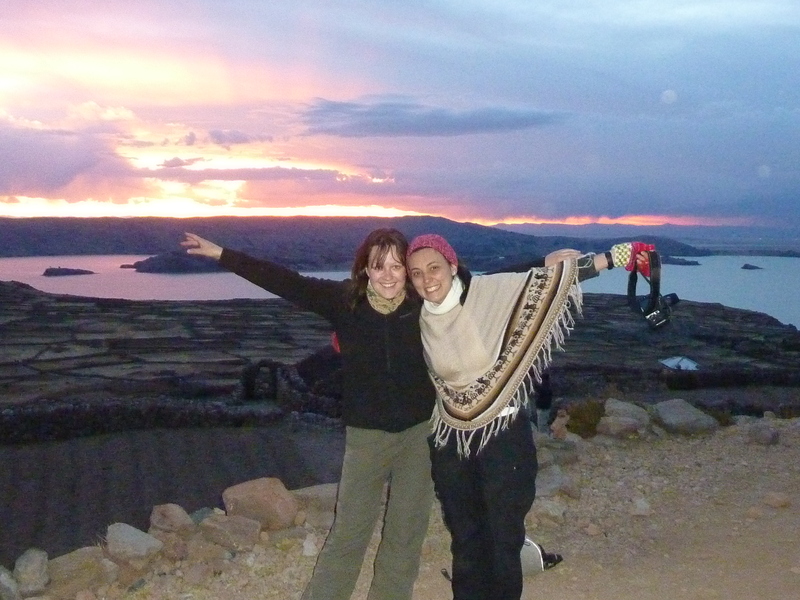 Carol and I, along with two Spanish ladies were sent along to Francisca and Ricardo´s house where she showed us to basic, yet comfortable rooms with a view over the tin rooftops and out towards the lake. Over lunch (cooked in a kitchen that probably wouldn´t have passed any health and safety inspections), we chatted – or rather I listened and understood all the Spanish chat, but by the time I´d selected the correct pronoun and conjugated a verb in the right person, tense and mood in an attempt to join in, the conversation had moved on… In any case, it was nice to be able to follow the conversation and laugh in all the appropriate places! At 4pm we gathered in the attractive main plaza to meet the rest of our tour group for a walk up to the top of a hill to watch the sun set. The walk, though steep, was pleasant in the company of interesting and friendly people, and the good conversation distracted us from the fact that I was, once again, walking up a VERY steep hill at high altitude. 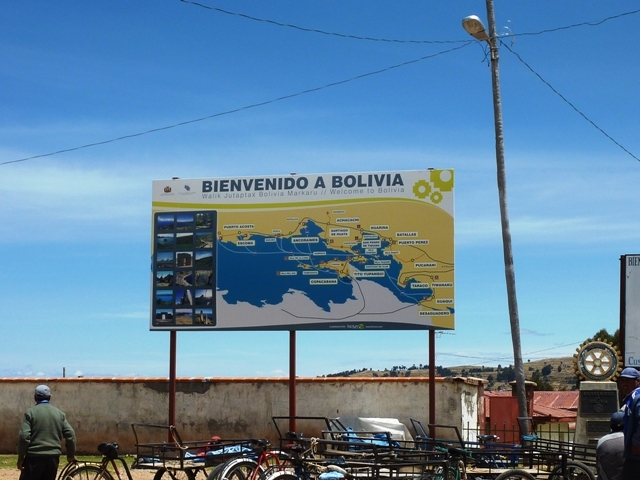 It was during the walk that we caught our first glimpse of Bolivia, and Moses made sure to reiterate many, many times that it was very important to remember that the lake was 60% Peruvian, and only 40% Bolivian..! We reached the summit just as the sun was setting (it was almost as if they´d planned it that way) and the small boys who had been playing panpipes (badly) as we walked up the hill in an attempt to extract money from us continued with their efforts while we looked out over the lake with our eyes and our cameras, snapping digital memories. And still the day wasn´t over… After a questionable dinner, Francisca and Ricardo lent us some traditional clothing for the party at the other side of the plaza. 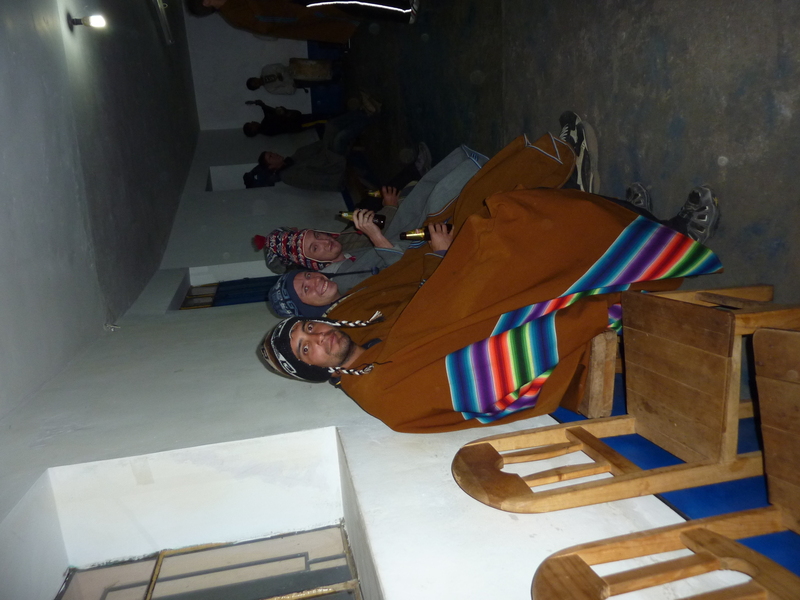 Inside the bare room, a row of uncomfortable looking male tourists sat in Ponchos and silly traditional wooly hats, while a band played panpipes and some other instruments for us to dance to. And dance we did. But only once, because it was all a bit weird (in a totally wonderful kind of way) and the dresses were kind of uncomfortable. So we sneaked off early to prepare for an early start the next day. 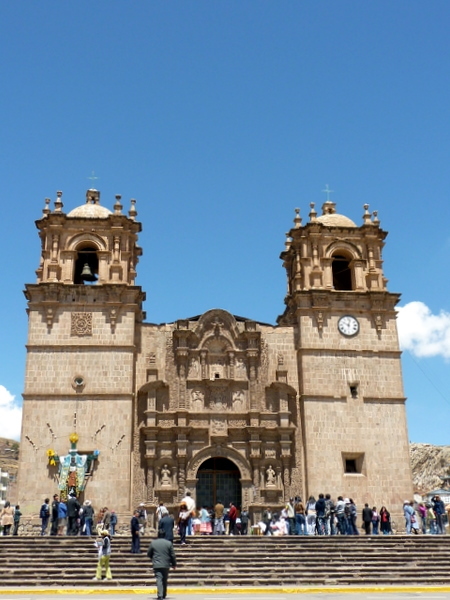 In classes, and with my family in Arequipa, we had spoken about my plans to visit Puno, and the general feeling I got was that they didn´t really like it all that much. This opinion was summed up by Vivi´s 10 year old friend who, upon hearing the word Puno, exclaimed that she had been there and it was (h)orrrr-ee-bley. And also ´feo´(ugly). But the lake is nice! 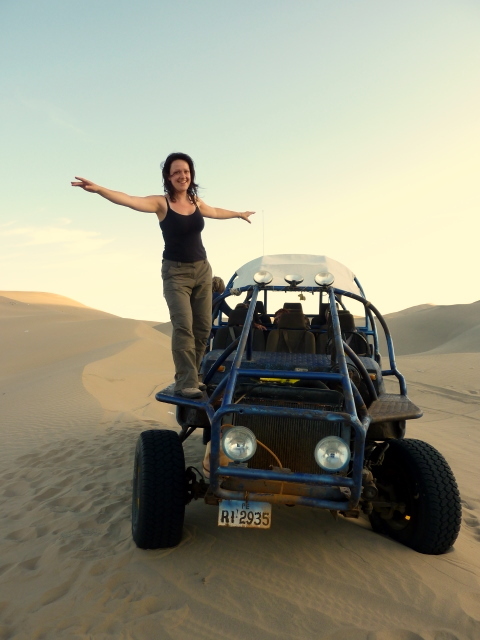 When I was driven through the deserted streets at 2:30am in the morning, I could kind of see where they were coming from, but it didn´t stop me from heading out into the bright sunshine with an open mind this morning. After all, they also told me that it would be really cold, and it wasn´t. 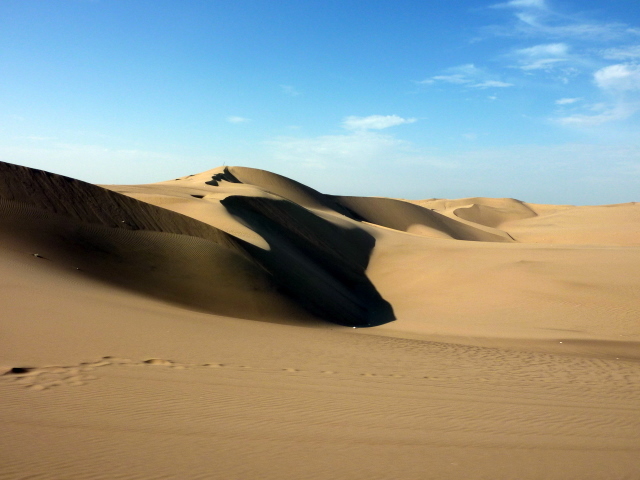 I spent most of my bus journey wishing I wasn´t wearing so many clothes because I was too hot. I quickly found my way into the centre (a 5 minute walk, rather than ´really far´as the taxi driver at the bus station would have had me believe) and past the small, but attractive Plaza de Armas and cathedral, and I decided immediately that I kinda liked the place. It wasn´t shiny and splendid, with neat and tidy decorative buildings like Arequipa, and rather than a couple of immaculately presented volcanoes to frame the city, there was a jumble of untidy hills covered with ramshackle buildings, which were either not quite finished yet, or well on their way to falling down. The roads were a lot more dusty (and in some cases a hell of a lot steeper), but they lent a South American charm to the scene, especially with the abundant moto taxis and rickshaws making their way around the city, and a lot more people going about their daily business in traditional dress, as opposed to just for the tourists. I took a walk down the short main street, before heading in the direction of the lake, which I had briefly glimpsed on my way down the big hill from the hostel… but alas, I was distracted by the biggest street market I have ever seen and wandered off track, down endless roads of stalls with people selling eggs, potatoes, fresh fruits, clothes, shoes, toiletries, meat, furniture and just about anything else you can imagine. Down every road, rickshaws and moto taxis battled their way through the hoards of pedestrians and I walked around feeling as if I had been transported into another world. And got lost. But Lake Titicaca is pretty massive so it wasn´t long before I was perusing the craft markets by the immense sapphire blue lake. Heading back into the centre, I got lost again in the tangled market filled streets, and it didn´t really help that, not only did my map lack many street names, but many of the streets also lacked signs bearing their names, but as before, it was hard to lose sight of the vast lake, so by working out what direction that was in, I was able to find my way back to the main street to buy an empenada and an ice cream before tackling the steep slope back to the hostel. 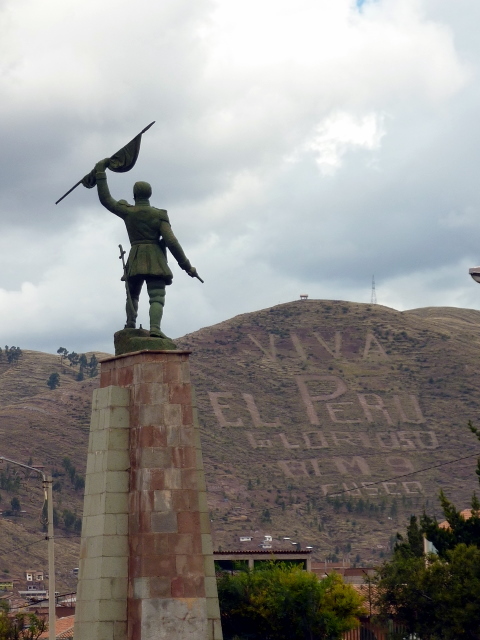 I had been pleased to find that I hadn´t come down with that ´Cusco feeling´on arriving at an altitude of 3875m, no slight nausea and headache this time, but because of the lack of physical effect, I forgot about the lack of oxygen and found the climb back up hill tough going. Just around the corner from the hostel, I spotted a blue sign pointing to Huajsapata park, and since blue signs usually mean something of interest, I followed it to find a stunning view of the lake, and a big statue pointing it out to me… just in case I hadn´t noticed! 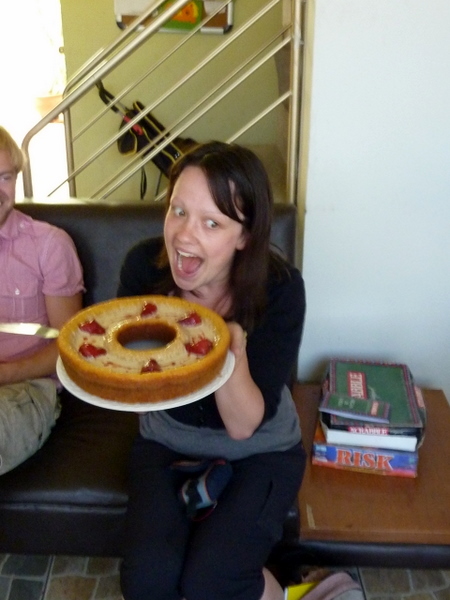 I had an enjoyable last class – There was a fun atmosphere, Malena was in a playful mood and had even baked a delicious cake which marked the occasion of my departure from the school and from Arequipa. We finished the morning with lots of photos of us to help with the memory of an awesome experience with some fabulous Peruvian characters. That afternoon, I took my last walk down Spaghetti Bolognese / Guitar Street (might have made up that name for it…), thinking about how much I would miss a street full of guitar shops and budget places to eat. Later, as I got ready to move out of my Family home, Rosa presented me with a gift, of a pair of earrings, before piling into the family Beetle to take one last hair-raising car journey through the crazy traffic to the bus terminal – Rosa reiterating that I was welcome to come back and stay any time. At the departure point for my bus, I took my bag over to to luggage compartment, where the driver said the word ´Puno´ and then stapled a ticket bearing the word ´Cusco´onto my bag and bus ticket… it took all my will to ignore my eyes and trust in my ears, especially since noone checked the ticket as I boarded the bus, and there was no announcement at the beginning of the journey to say where we would be going. But it would probably be OK. He definitely said Puno… didn´t he? Six hours later, to my relief, we arrived in Puno where, for the first time I met one of the legendary taxi drivers that tries to tell you that your hostel is too far away from the centre and that you should try the one he´s getting commision from instead, and then tries to overcharge you for the journey. So I ignored him and walked out of the all but deserted terminal to find another taxi, which drove me to my intended destination at a reasonable price, and checked to make sure they answered the door before driving away. We drove through the deserted streets of Puno, past dogs scavenging in piles of litter next to overflowing bins, and crumbling buildings. 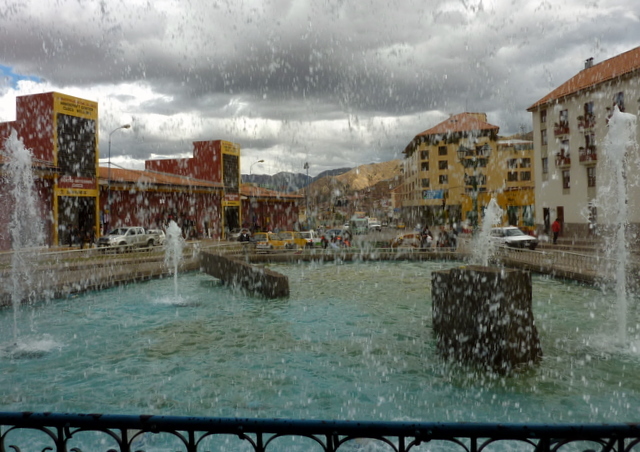 But I already knew that Puno wasn´t as shiny and grand as Arequipa and that the 2:30am version of the place probably didn´t give an accurate first impression, so I reserved my judgement until daylight, just pleased to get into a nice warm bed again. Even if it was a top bunk. 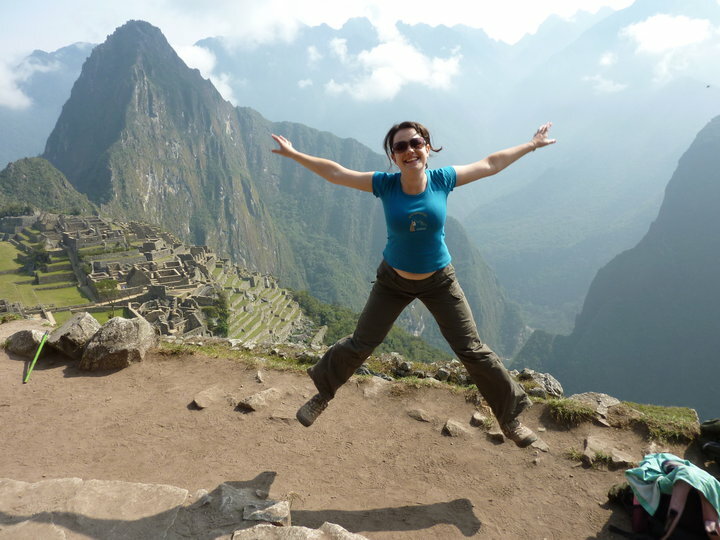 Back when we were in Machu Picchu, an odd thing happened… while Paul was off taking photos of something or other (probably the ruins) a school girl approached me, whilst waving a camera around and said something like ´toma un foto´and so I agreed that I would take a photo of her and her friend. Except that the next thing she did was pass her camera to her friend, and put her arm around me. We smiled, had our photo taken together and then she went away, leaving me a little bit confused. Maybe I look like someone who´s famous in Perú? A bit later, after I had tracked Paul down, but before I´d had a chance to tell him about my new found celebrity status, another school girl came along, this time waving a camera at Paul, and as he reached his hand out to take the camera, the girl passed it to her friend, jumped to Paul´s side and smiled for the photo. And so now we were both confused. It took a while to work it out, but it turns out that the only logical explanation was that they were playing Gringo Bingo: a game whereby they were racing to be the first to have their photos taken with a whole list of different gringos. They chose me, because I was wearing a Machu Picchu T-shirt, and Paul because, with his sunhat on, he looked a little bit like a cowboy. Next, I imagine they went on to find someone blonde, someone with red hair, someone with an Inka Cola T-shirt… etc. I only hope that we helped our photo-buddies to get a full house!